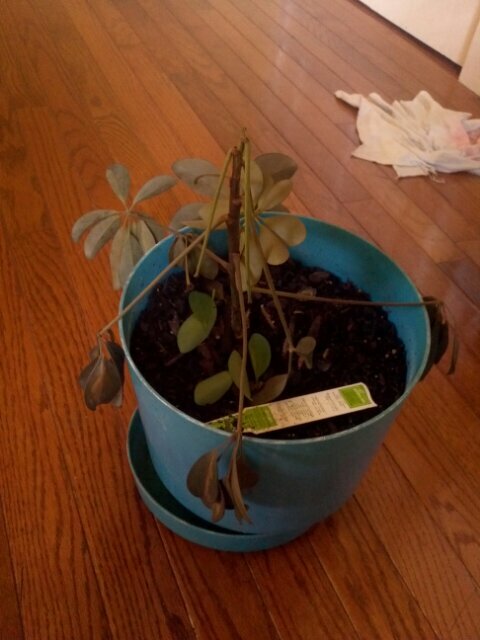 My umbrella plant is dying (dead?). Can she be rescued? Do you guys think my poor plant can be rescued? Or is it too late? I think it's too late. May it RIP. Green Mantis wrote: :( I think it's too late. May it RIP. I hope she had a good life before i over watered her. Any recommendations on another houseplant? I'm looking for something that doesn't get too big and only needs to be watered 1-2 times a week. I think you are overwatering! I don't water any of my houseplants more than once a week, sometimes less. I do mist them in between though. You are looking for something for low light conditions? I like my peace lily which is easy care, has pretty white blossoms, and never gets very big. rainbowgardener wrote: I think you are overwatering! I don't water any of my houseplants more than once a week, sometimes less. I do mist them in between though. I have a couple of Christmas Cactus growing in small pots in my kitchen that only get partial light from a nearby window and they are doing great. All the other potted plants reside on my front and back porches and only come in when a hard freeze is forecast. Potted Rose rescued! Bloom! Dying! Ahh the shame of it all..